This coming weekend sees the start of the artist Richard Wilson’s ‘Hang On A Minute Lads, I’ve Got A Great Idea’ at the De La Warr Pavilion in Bexhill. Following Anthony Gormley’s ‘Critical Mass’ in 2010, there is now the chance to experience more rooftop art. 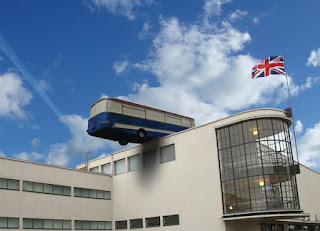 This time, in homage to the conclusion of the 1969 film ‘The Italian Job’, you get to see a full sized-replica of a coach balanced precariously on the edge of the building’s roof. The title of the exhibition is the film’s final line, delivered as the camera zooms out to the panorama of the Italian Alps leaving the Mini-driving heisters balanced on the fulcrum of a dilemma against a pile of gold bullion. Wilson’s obsession with the film, and its iconic use of Mini Coopers, Michael Caine and football supporters abroad, has led to the work being commissioned as part of the British Cultural Olympiad; the exhibition runs until September and is free. There is also an open invitation to Friday evening’s launch party, with music throughout the building from DJ Stephen Mallinder. When I saw that name I also thought “hang on a minute”; then it came to me: Stephen ‘Mal’ Mallinder, founder member of Sheffield Dada-inspired electronic industrialists, Caberet Voltaire. It also sent me scurrying to a box of 7” singles where I found their ‘Extended Play’ EP, their first release on Rough Trade from 1978. Including ‘Do the Mussolini (Headkick)’ and an esoteric cover of the Velvet Underground’s ‘Here She Comes Now’, this EP, together with another 7” in my box - the first Mute Records release from the same year, The Normal’s ‘TVOD/Warm Leatherette’ - signalled independent music’s move away from the rama lama of landfill punk. I’m sure Mallinder - now relocated to Brighton from Sheffield, via Australia - will be playing equally adventurous music on Friday; and it’s good to see that there is room for avant-garde musical experimentation in the British cultural landscape as well as your run of the mill coach hanging from the side of a building.